The unit installs easily with 2 sets of spring connectors; one each for the loop wire around the perimeter of the yard and the short connection from the protector to the transmitter. In addition to providing 24/7 protection from catastrophic lightning strikes the unit also provides AC shut off protection for each of the two available power outlets located on either side. 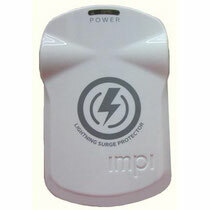 The Impi Lightning protector provides the greatest value available in lightning protection even amongst competitive products which only allow the use of one available outlet. The outlets are conveniently turned to accommodate both traditional plugs as well as larger AC transformers. A power indicator on the front gives visual indication the unit is powered and operating properly. The Pet Stop Power Wizard is an engineering wonder. When properly installed the power wizard will cause the Pet Stop pet fence to operate normally for 36 to 48 hours if power is lost. Once power is restored the power wizard then trickle charges the 12 volt battery back to full charge. A red indicator light comes on when the Pet Stop pet fence is running off of the battery backup. The light goes out when the pet fence has power again. 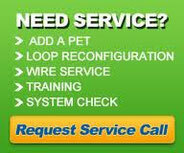 The Pet Stop battery backup system is designed to be no maintenance. Some would argue that there is no need for a battery backup because once a pet is trained to an electronic underground fence they will stay in the yard even if the system is not working. While this may be true for some dogs it is not true for many others. Some dogs figure out that their collar has no audible warning tone and they will escape the dog fence boundary within 24 hours or less. We have customers whose dogs have done this. Never assume that your pet will not leave a pet fencing area if the pet fence is not working. Most dog fences are installed in the garage due to easy access for technicians and because most people are in and out of their garage every day which allows them to monitor the pet fence and ensure that is in fact working. A lot of outlets in the garage are GFI (Ground Fault Interrupted) outlets. GFI outlets are notorious for tripping off. Someone running a hair dryer in the bathroom may trip a garage GFI outlet. This is just one more reason why a Pet Stop Power Wizard and Battery Backup are critical for the safety of your pet. For a very minor investment you can have the peace of mind that rain or shine your pet is safely contained within their electric pet fence boundary. When operated as a wireless transmitter, the signal field radiates up to approximately seven feet from the unit. When used as a wired unit, the transmitter emits a maximum signal field of approximately four feet on either side of the indoor boundary wire. The maximum signal field will vary depending on the configuration of the boundary wire. The IT-200 activates the Pet Stop collar to train your pet to stay away from an area or a piece of furniture. The Pet Stop collar will administer a mild correction whenever your pet enters the area protected by the IT-200. These batteries will work with your Dog GuardDG9XT, DG-9000, DG-5000, or DG-3000 pet containment collars to provide the perfect power source. They will also work with most Contain-a-Pet dog fence collars, including the larger blue receiver and the newer small receiver. Our batteries are designed and assembled in the USA to exceed manufacturer's specifications. Each individual cell is capped and welded to the next cell, providing reliable contact. These are the best quality batteries available for your Dog Guard or Contain-a-Pet underground dog fencing collars. Do you need to replace your Pets' contact posts? If they're worn, damaged, or you need a different length - replace them with new Premium Quality Perimeter Technologies hypo-allergenic stainless steel contact posts, available in four sizes to suit all coat types. These posts are perfectly made to fit your Invisible Fence, Contain-a-Pet, PetSafe, Perimeter, or DogWatch brand pet fence receiver, and some Petsafe Professional dog fence collars. The contact post tips are machined smooth for your pet's comfort and safety. 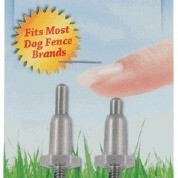 The threaded shaft has a thread locking compound pre-applied so your pet's activities won't shake the posts loose. Perimeter Technologies is the most innovative company in the pet fence industry, making the best premium pet fence products on the market today.